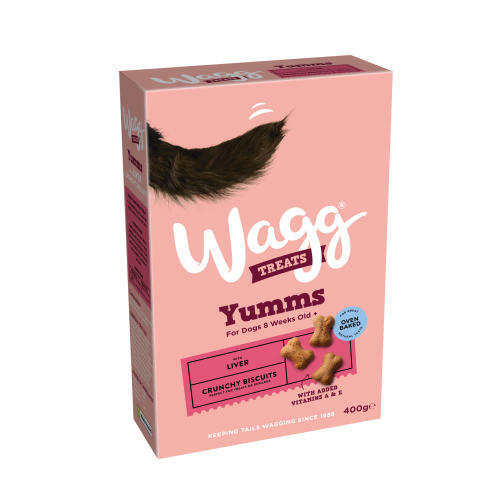 Wagg'mmms Dog Treats bone shaped biscuits have been formulated to keep your pets tail wagging, its crunchy texture will help keep their teeth clean and are an ideal treat whether on a walk or out training. With added vitamins A and E which helps support your dog’s immune system the Wagg’mmms are a tasty treat. Nutritional Analysis: Protein 20%, Fat Content 9%, Crude Fibre 3%, Crude Ash 8.5%, Omega 6, 1.9%, Omega 3, 0.4%. Nutritional Additives: Vitamin A 5000 iu, Vitamin D3 500 iu,Vitamin E 75 mg, Cupric Sulphate Pentahydrate 7 mg,Zinc Oxide 20 mg. Antioxidants, Preservatives. Nutritional Analysis: Protein 20%, Fat Content 8.5%, Crude Fibre 2%, Crude Ash 7%. Nutritional Additives: Vitamin A 5000 iu, Vitamin D3 500 iu,Vitamin E 75 mg, Cupric Sulphate Pentahydrate 7 mg, Zinc Oxide 20 mg. Antioxidants, Preservatives.